Whirlwind WordSearch | Mac App Storeのアプリ検索・ランキング BuzzMac! 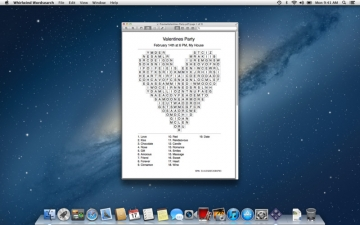 Are you searching for a good Macintosh puzzle-maker? The solution is right here! With Whirlwind WordSearch, you can easily make a wide variety of professional word search puzzles from your own word lists, in English or many other languages. Whirlwind WordSearch is perfect for enhancing your classroom study materials, creating customized puzzles for parties or special occasions, spicing up your newsletter, or publishing your own book of puzzle collections. Whirlwind WordSearch harnesses powerful features with a straight-forward user interface, letting you create great-looking word search puzzles right away, then unleash the more advanced options to design unique and eye-catching designs to surprise and delight everyone. Here are some of the features that make Whirlwind WordSearch an amazing puzzle-generator! * There are several supported languages/alphabets built-in besides English, so you can create puzzles with words in French, Spanish, Swedish, German, Russian, Japanese, or Greek. * Easily enter your word lists. Type them in or copy/paste a list from your word processor or the web. Work without a net... You can run Whirlwind WordSearch anywhere… you never need an internet connection to create, save, and print your puzzles. * Save your puzzle word list files, and open them again later to instantly create whole new puzzles, or share them with other Whirlwind WordSearch users. * Tailor the display and printing options to suit a variety of audiences and needs. * Supports Full-Screen mode in Lion (MacOS X 10.7) and newer. * Includes a comprehensive User Guide that contains tutorials, tips, and explains every option, getting you up-to-speed right away. * Copy and resize the puzzles and answer keys right into your own newsletters, worksheets, books, or other publications, or print them for handouts. * A built-in spell-checker alerts you to any misspelled words in your word-list before you print. * Create puzzles in upper or lower case, serif or sans-serif fonts. * Whirlwind WordSearch checks your word list for accidentally typed duplicate words. * Whirlwind WordSearch thoroughly checks the final puzzle and removes any randomly-generated duplicates of your words. * Whirlwind WordSearch also removes randomly-generated native "naughty" words in each supported language! * Simply increase the difficulty slider from "Very Easy", to "Diabolically Difficult", and Whirlwind WordSearch will add many tricks into the puzzle for you. For example, if you choose an "easy" puzzle, it will only place your words across or down. It will not overlap any of the words, and it will fill the rest of the puzzle with letters that are not in your words, making it easier to find the words. If you choose a harder puzzle, it will automatically start adding your words backwards and on diagonals. It will fill the rest of the puzzle with any letters (or only letters from your word list!) And on the hardest level, it will even sprinkle pieces of your own words into other puzzle locations as visual decoys.